I really rather liked this work for The Times by the agency Rothco (who are actually now part of Accenture). Bringing to life The Times' proposition of bringing new perspectives to the news, they have used AI to analyse his other speeches and recreate the speech that JFK would have made on the day he was assassinated in his own voice. Given current events in the US and the wider world, it's somehow particularly touching to hear this now. Bravo. Writing a book is hard. Frequently really hard. If I'm honest it sometimes felt like a marathon that just carries on indefinitely. I have to admit that for me the biggest challenge was probably fitting it in around existing work. So go into it with your eyes open. Don't do it for the money. Or at least not the money you make from the cover price. It's a nice bonus of-course but the real benefit comes from the follow up work that it brings. It's hard to quantify the exact payback that it has brought me but I know for a fact that it has secured me a number of larger scale projects and contributed towards me being chosen for many others. It also really helps with speaking gigs. Write it because you need to write it. I often think that you can tell when a non-fiction author is really passionate about wanting to get across their point of view and when they're perhaps just going through the motions. It comes through in the writing. This was a book that I not only wanted to write but also needed to. It felt like I was saying stuff that needed to be said and that's a good basis for undertaking any writing project. Putting it through a publisher does make a difference. I'd thought about self-publishing several times but I'm glad I went with a known publisher in the end. Somehow that has seemed to make quite a difference with a lot of people I've met since it came out. It's a physical manifestation of your thinking and your credibility. And for someone like me who runs their own business and for whom reputation is everything that can mean a lot. There's something about taking a physical book with you to a meeting that you just can't get from sending a client a link. It marks a moment in time, but it's like being in departures rather than arrivals. One of the weird aspects of writing the book was that I kept wanting to add to it, and build on it even after it was published. I guess that's the blogger in me. 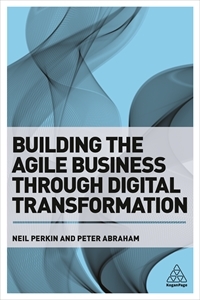 As part of the marketing for the book, I continued to write about the themes it covered over on the Agile Business Medium publication. This has been valuable not only in bringing the book to a wider audience, but also enabling me to take some of the ideas I talked about in the book even further. There's over 50 posts on there now, and a year's worth of writing. Would I do it again? Well, as I say, it's no small undertaking but on balance I would, yes. The group creates, not the individual. The kind of team dynamics that allow for this kind of group creativity are rare, particularly in buttoned-down, accountability-fuelled corporate environments. But how lovely and how beneficial to have the freedom to create in this way.